There's more than one way to be powerful . . . It is during a routine school project that Abby Silva--sixteen and nearly friendless--makes a startling discovery: She is descended from women who were accused of witchcraft back in 1600s Salem. And when Abby visits nearby Salem, strange, inexplicable events start to unfold. Objects move when she wills them to. Candles burst into sudden flame. And an ancient spellbook somehow winds up in her possession. Trying to harness her newfound power, Abby concocts a love potion to win over her longtime crush--and exact revenge upon his cruel, bullying girlfriend. But old magic is not to be trifled with. Soon, Abby is thrust headlong into a world of hexes, secrets, and danger. And then there's Rem Anders, the beautiful, mysterious Salem boy who seems to know more about Abby than he first lets on. A reckoning is coming, and Abby will have to make sense of her history--and her heart--before she can face the powerful truth. I like witchy things especially those related to Salem, Massachusetts and witch trials, so I was excited and intrigued about the premise of Spellbinding. Gold offered a sweet, well paced tale that I enjoyed but sadly will forget after writing this review. The tale begins when we meet Abby Silva a sixteen year old suffering from nightmares, who is not part of any group at school; she simply exists. Like most teens, she has a crush on the star jock, hates her hair and longs to fit in. A school project, a trip to Salem, and strange occurrences lead her to believe she is a witch. The tale that unfolded was an easy, enjoyable read but sadly it was completely predictable and lacked depth. I started out liking all the characters and we catch glimpses of who they are, but no one was fleshed out leaving me disappointed. Abby is likable, and I felt for her as she dealt with the “mean girls”. Rem was sweet, and mysterious but sadly underdeveloped. Travis had a little more depth but again I was left wanting. The characters fell into typical clichés with predictable behavior and never developed their own unique voice. What frustrated me, was that we caught glimpses of something more from all the characters. There is a love triangle, but not in the traditional sense. Abby has feelings for both boys; one is a crush and one is something new to her. Confused she was insanely immature and at other times sensible. Her behavior to me felt young and maybe that is because she is socially awkward. Her actions were more along the lines of what I would expect from a newly turned thirteen year old. The world building had potential and ironically I breezed through the tale as it had an easy readability but the premise was cookie cutter in its ideas and the author failed to make them her own. I found myself frustrated and wanted more explanation, back history and depth. Information and history presented themselves as statements and lacked any detail. At times I felt they were simply added to move from point A to B in the plot's development. The villains are vaguely touched upon and never reached their potential. I quickly consumed this and was certainly entertained but I never fully slipped into this world. I honestly think this should be marketed for middle grade readers. 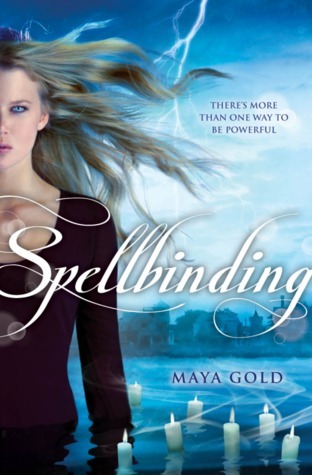 Overall Spellbinding was a cute coming of age tale with a witchy twist geared towards a younger audience. The author has potential and I personally felt everything should have been expanded upon and the characters given their own unique voices. As written it reads more like a MG novel. That's too bad because I too enjoy reading books based in Salem, MA. and/or its history. It doesn't sound like something I'd like but my young daughter might so I'll keep an eye out for it. You had me excited with the cover and the blurb, sad that the story is predictable and forgettable. Hmm, maybe it's just the starts. Each book will get better? Oh no, my hopes were high for this but the things you mentioned would drive me batty! I really need my characters to be perfectly fleshed out & for there to also be a decent amount of world-building. Thankyou for your honest review Kimba, I might take a pass on this one. I have to agree with you on the lack of depth and development. It wasn't bad -- it just could have been so much more. A little disappointing. Agreed it wasn't bad and i think it would make a good MG book. UGH, I had high hopes for this one. It sounded so good. I hate un-fleshed out characters though. Too bad. No, you would not be happy. Once again a book with so much promise is a let down. I have this coming up and I am not looking forward to it because all the reviews are dismal. Funny this was one of the top requested books on NG and now it is a flop. I will be wading through this soon wish me luck. I love witch books, it's too bad this one was just so underwhelming though. That's pretty common these days and I end up with lots of DNF books because of it. I'm sorry it didn't work so well for you, but thanks for your honesty! with predictable behavior and never developed their own unique voice." That's a shame Kimba! Even more so since there were a few times when a flash of potential came through but was never fully realized. As much as I enjoy anything relating to the Salem witch trials as well, I think I'm going to be passing on this one for sure. I need the characters to reach out and grab me, and these ones seem like they're content to sit there with their hands folded neatly in their laps. Give me grabby-handed characters! We definitely felt the same way about this one. There was so much potential for this to be wonderful and to break out of that cookie cutter mold and it just fell flat. Yes Nick, I have a beautiful copy of it and agree its one of my favorites too. thanks Lisa, I am drawn to the subject too. Well, I knew I wouldn't like this book since Barb hated it too. Ughh. It's so disappointing that the author doesn't use anything that's fresh. It's a bummer that the story lacks a back story and history. I would be frustrated too. I love stories about the Salem witch trials too. It was such an intense period. Have you read Arthur Miller's Crucible? I love that book. It portrays the trials in such a powerful way. we need to see a lot of growth. I didn't realize this one had a younger feel to it. It sounds like something I might enjoy, but it'd be very low on my TBR list due to the lack of originality. Great review, thanks for your honesty! I've heard a lot of not so good things about this one so I'm so glad I never added it to my tbr list. It's too bad that you didn't like it though. yeah, it had a lot of potential, it just wasn't developed enough for me. Wow, actually a bummer book in the pile!!! I wouldn't have believed it if it weren't for the fact that you were kind of, *cough, cough* due to hit one soon. You just such great luck with books lately or you've been just posting all the good ones? Oh well, it happens... at least you stuck with it to review it. A two, I would've dropped sooner but I can see how you continued if you saw it's merits as a MG! Great balanced review based on what YOU like!!! It was an easy read, I only DNF a book if I cannot at least enjoy it. That's a shame. Based on the cover and the blurb, this may well have been something I would have picked up...and probably not finished. I have absolutely no interested in MG/younger YA. Either way, I appreciate your review and your honesty! that is how i feel Liz, I am searching for YA like LaFevers, Dan Wells, Coleen Hoover etc. I love witch books, but I know exactly what you mean when you say you will likely forget about it after writing the review. I have noticed that the more books that I read that the ones I am meh about are the ones that are just not very memorable. Plus I am a little over younger YA/MG books. I so agree Michelle, I am trying to be very selective, since I need/want my YA to be on the older side of the spectrum and I want details.